The Starling Jet now joins electric or hybrid flying commuter craft from sources all over the world. A Middle-East backed, London-based project, the Starling Jet is swoopy and high-winged, and comes in three sizes with different missions. Time, a most precious commodity, is the major selling point for most of these sky taxis. Saving an executive’s schedule enhances productivity, whether it’s whisking a CEO over the traffic jams in Dallas or Dubai. For many similar machines, the impetus is to democratize the flight experience, offering many an Uber-like experience at Uber-like prices. Samad Aerospace, creator the Starlings, is looking toward a more exclusive market. All such craft promise the convenience of point-to-point transportation, foregoing intermediate shuttle or cab rides to get to an airport, while expanding the range of takeoff and landing locations. Like Los Angeles, which once required flat roofs on new high-rises to accommodate helicopter traffic, other urban areas may changes zoning and other codes to facilitate the growing stream of overhead traffic. The third component, environmental protection, comes from the smaller Starling Jet’s all-electric propulsion and the larger machine’s hybrid drive train. As noted above, Starlings will be available in three sizes. The unpiloted UAV Starling, fully-electric, will carry 10 kilograms (22 pounds) at 150 mph between 100 and 300 miles, if the specifications claimed by Samad are achieved. This would give it a utility well beyond most smaller UAVs, enabling transport of fairly large packages over intermediate distances or extended “hang” time for “observatory” function. Carrying up to seven passengers, the all-electric e-Starling could provide business and leisure domestic travel for its private owners, carrying them at 300 mph for up to 400 miles. For UNHW (ultra-high net worth) individuals, the Starling Jet, a hybrid-electric craft, would carry up to 10 lucky souls at 460 mph between 900 and 1,500 miles. This exclusivity and bespoke nature of the machine carries over into the UNHW, politicians, and corporate leaders to which this machine is addressed. Rather than pivoting the fans on the wing to transition from vertical to horizontal flight, the Starlings retain a fixed position for the powerplant and divert airflow through a flexible duct. It will be interesting to see how this arrangement holds up in repeated use. Powerplants for the different machines are not specified yet, although the company is connected to a unique “powerwall” that uses North Sea gas – part of the existing infrastructure in the UK – rather than solar or wind power for energy. 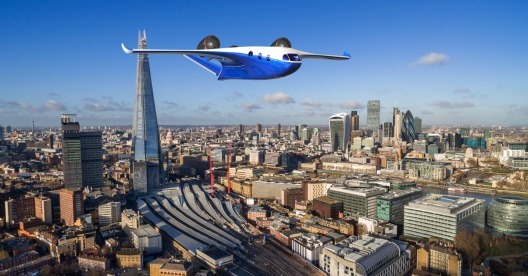 Seyed Mohseni, CEO for the power system and VTOL wings of the business, claims 95-96 percent efficiency for the micro-turbines intended to provide electricity, heat and hot water for British homes. This unique approach to finding “green” approaches to domestic energy needs and future transport shows why the firms have attraceted academic support and venture capital. The next few years should be productive and exciting for Samad.